Great for owner occupied or investor. Unit 104 Rented at $575 a month. Unit 106 renovated and ready for tenant or Owner occupant. Both units have 100% ceramic tile for low maintenance costs. 106 unit has new tile counter tops with back splash, fenced yard and even has a garden. . Both units are 2 br/1 ba and the rent from 104 Massey would almost pay your mortgage. nit 106 is now vacant. Fenced yard. Many updates. 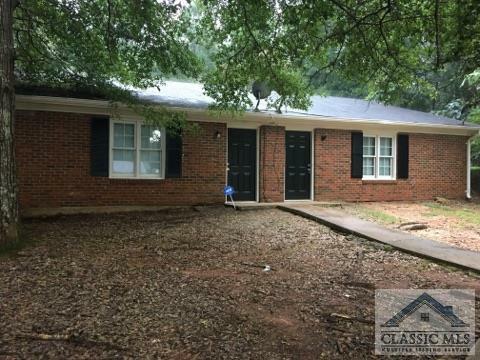 Seller will pre-lease if needed, but this is great for an owner occupant that wants to live in one side and rent the other! New exterior paint. Sits back from the road a bid for more privacy. Sayemore Heights is a subdivision within the city of Athens, Georgia. There are currently 0 Homes for Sale within Sayemore Heights, with asking prices ranging from $0 to $0. The average list price per square foot of the available inventory in Sayemore Heights is $0, which is the Athens average of $222. Recent comparable homes have been selling for 99.47% of their asking price. Waterfront homes represent of the available Sayemore Heights inventory. The population of Athens, according to the 2010 Census, is 115,452. The total number of households in the zip code of Sayemore Heights is 8,250, with an average household size for of 2.51 people. The total number of renter households within the zip code of 30601 is 5,191, which means that 37.08% of households in this zipcode are owner occupant households. 104 Massey Lane #2, Athens GA 30601 is a Multifamily, with 4 bedrooms which is recently sold, it has 1,750 sqft, 0.0-0.25 sized lot, and 0 parking. A comparable Other, has bedrooms and 0 baths, it was built in and is located at and for sale by its owner at $ 0. This home is located in the city of , in zip code , this County Other, it is in the Subdivision, and Boulevard are nearby neighborhoods.